Last Friday, I went to Flowers@Oxford, an international floral extravaganza organised by Judith Blacklock and Lieven Hemschoote. 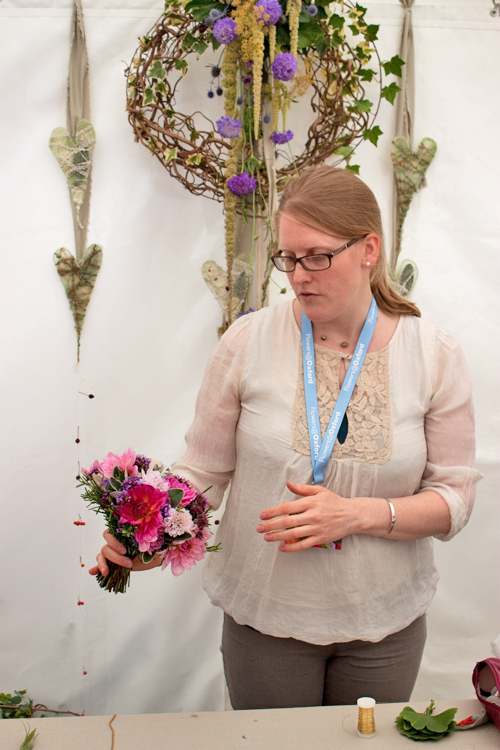 And today, I thought I’d share with you my first post from the event…a bridal bouquet demo by Claire Cowling from Thrive Floristry. 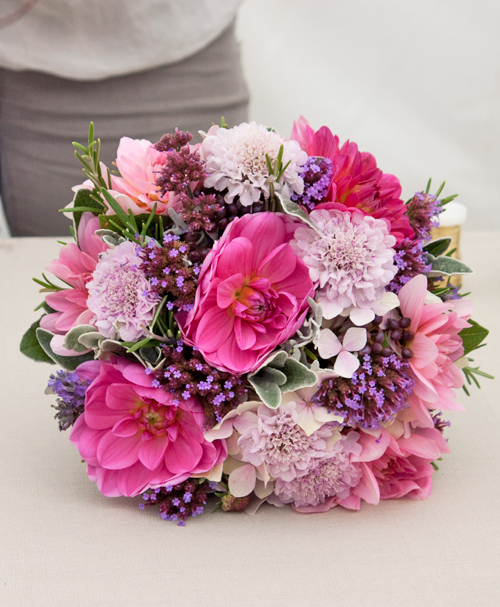 It took place in the British Flowers Wedding Marquee and Claire used a selection of beautiful flowers supplied by The Garden Gate in Suffolk. 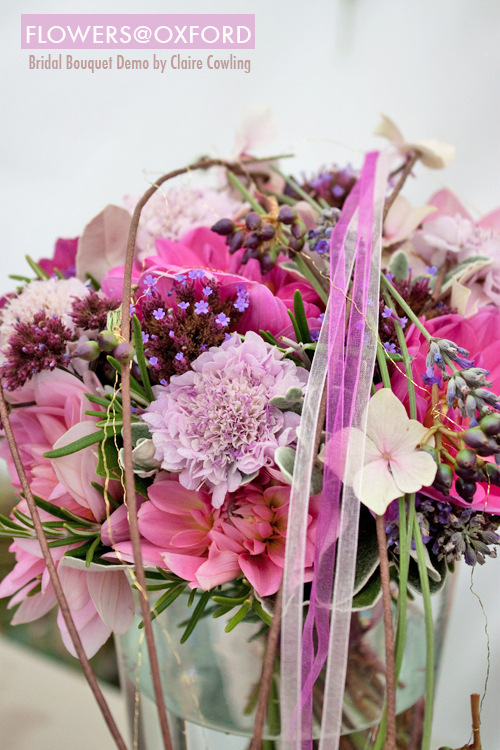 In advance, she had prepared a bouquet, which included dahlias, scabious, Verbena bonariensis, senecio and rosemary, which you can see immediately below. 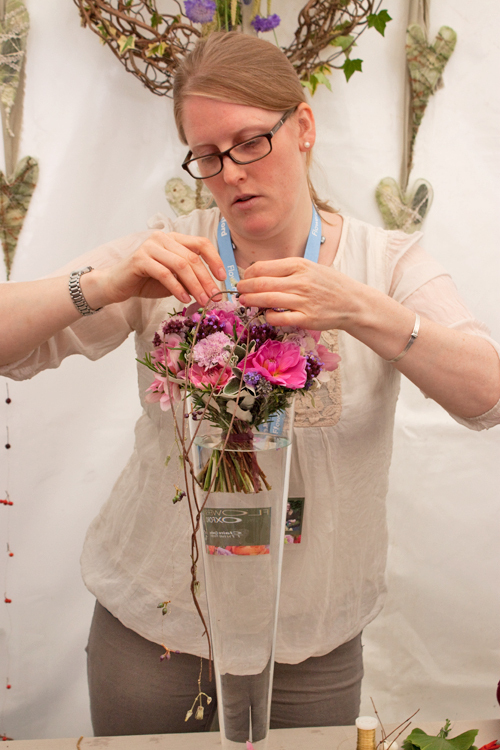 Then she showed us how to add a variety of adornments to make the bouquet more distinctive. She had made a frame using long stub wires, covered in brown stem tape. And she inserted it into the design, before securing the ends. 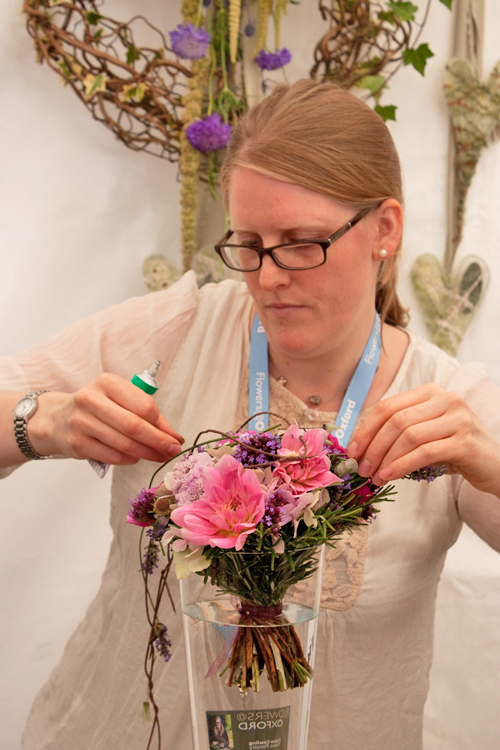 Different lengths of lavender stems and individual hydrangea florets were attached using cold glue. And then she secured lengths of gold bullion wire with berries attached to the design. Finally, she added two delicate contrasting ribbons. 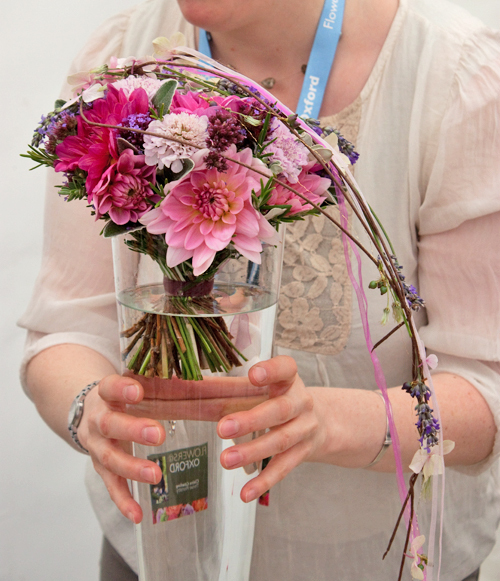 Here’s the finished bouquet, modelled by Claire herself. Isn’t it lovely? And here’s a close-up, so that you can see the detail. 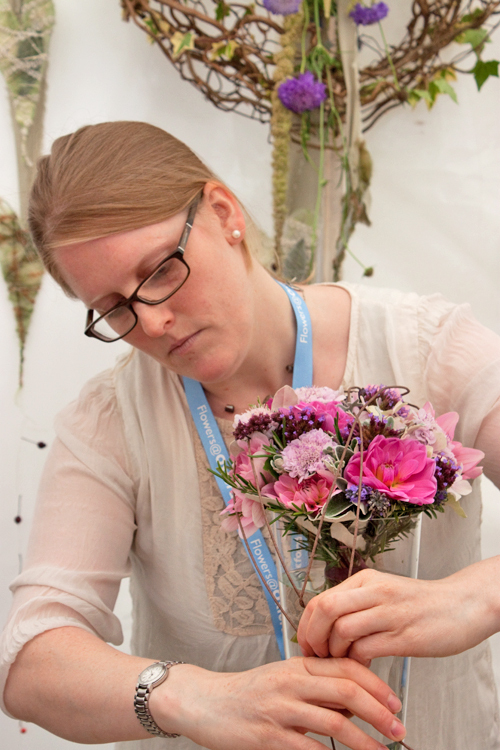 Based near Bury St Edmunds, Claire runs a flower school. 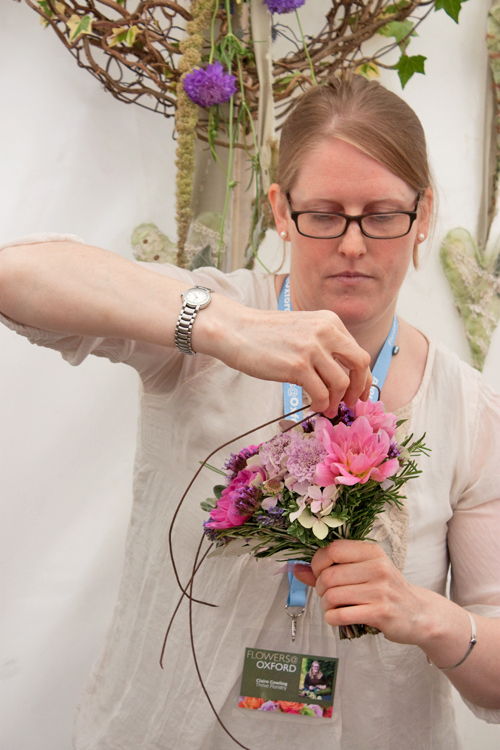 If you’d like to find out about her courses, simply pop over to the Thrive Floristry website. And look out on Flowerona over the coming weeks, as I’ll be featuring the other two bouquets, which Claire made at Flowers@Oxford. Beautiful! I love Claire’s work! What a happy chance that I was standing next to you while you photographed this and was able to meet you briefly after following your blog for some years now and marvelling at the amount of hard work and commitment that it must take. 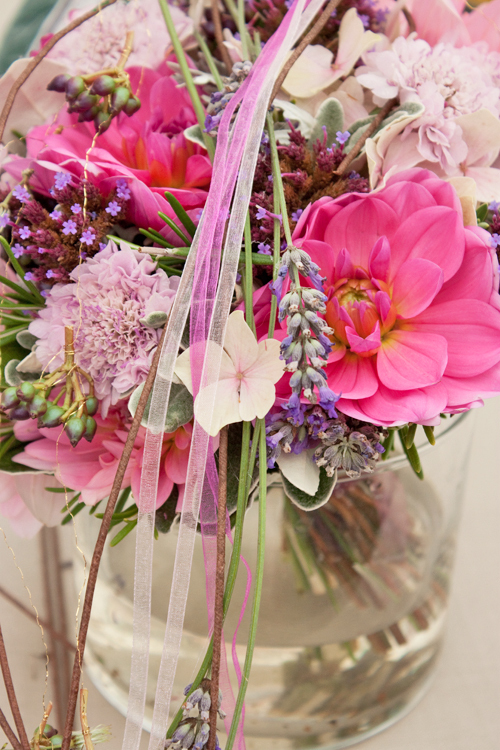 Thanks for all you do to keep us flower fans satisfied! 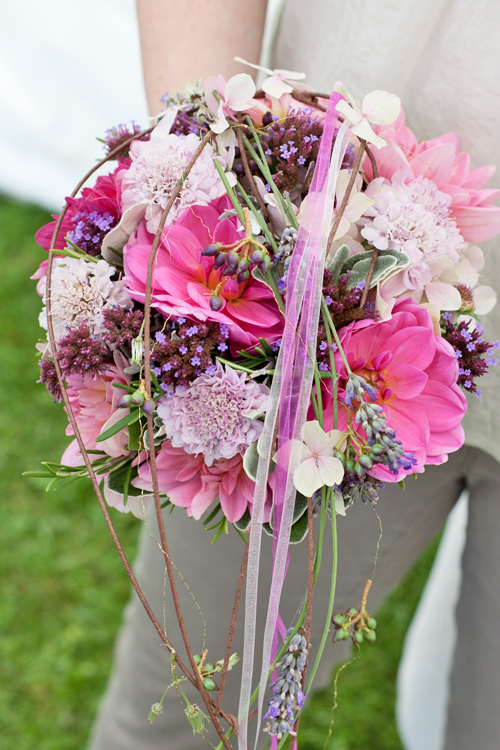 I love the bouquet with just the flowers. It is truly stunning!